I love Audery Tautou. I think she is an amazing actress and she is absolutely stunning. Her style has really evolved over time and she just keeps looking better and better. Lets have a look at how her style has changed over time. 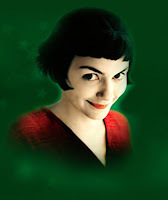 Amelie: This was the first movie I saw that wasn't in English and absolutely fell in love with Audrey Tautou. Seriously, if you haven't seen this movie, you have to watch it. Its beautifully made and is just so sweet. Ok, so this picture on the left is slightly creepy, but she had a very distinct style in the movie. Her look was fun and colourful. Her hair was very short and girly. It was really fun watching her play with people's lives and the acting was just perfect. 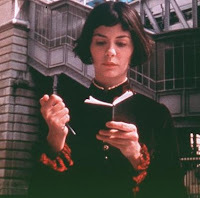 The Da Vinci Code: I'll admit, I prefered the book to the movie, but Audrey Tautou did look good. It was clear that she had grown up and adopted a more mature style. She stuck to blouses and cardigans in this movie. 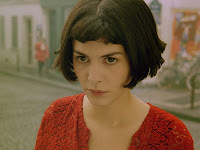 It was clear to see that Audrey Tautou had definitely grown up and was trying to establish herself as a mature actress. 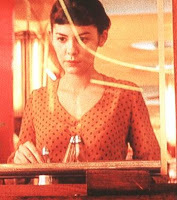 I quite liked what she as wearing, but would probably only imitate her look for work, Her hair was beautiful in this movie. It was so much more grown up and really well kept through out the movie. Priceless: I saw this movie the other day and would definitely recommend all of you to watch it. Its really funny and is a proper rom-com. It is such a charming movie. Audrey Tautou basically plays a gold digger, who's sole aim is to marry rich. She likes spending money in this movie and you see her in a lot of Chanel and Louis Vuitton, as well as sum stunning jewellery. There is this one scene where she gets locked out and only has her bikini and a sarong to wear. The bikini is beautiful and Audrey Tautou looks stunning in it. Also keep an eye open for the black dress she wears towards the end of the movie. It is perfect. Check back soon, where Leia will be reviewing Audrey Tautou's style in her new movie 'Coco Avant Chanel'. P.S: Don't forget to enter our Chickdowntown giveaway. I love Audrey! Shes so beautiful! .x. i like audrey a lot too. she also reminds me a bit of shannyn sossamon, who i also adore. She is so very lovely!! Can't wait to read your Coco review. I'm so excited for her to be in the new Chanel movie too! I think she'll just be perfect. i can't wait to see coco avant chanel!! Awesome post! Excellent pics and reviews! She is a lovely lady and I haven't watched the film, I will definitely have to check it out! I didn't know she was in the Da Vinci Code, I've never seen it! i can't wait to see coco avant chanel... audrey is the perfect woman to play her... so beautiful!